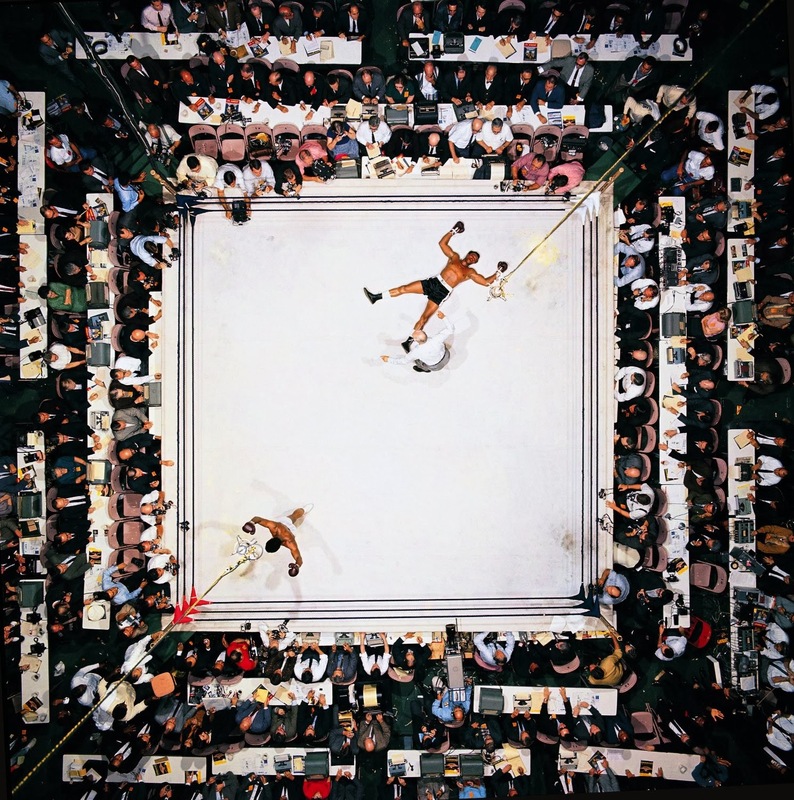 A dramatic overhead shot by Neil Leifer, generally regarded as one of the greatest sporting images of all time, features the prostrate form of Cleveland Williams while Muhammad Ali strikes a victory pose during a knockdown in their 1966 title fight. As Neil Leifer’s all-time favorite photograph, this amazing shot was captured from a camera hung on a rig 80 feet (24 meters) above the ring at the Houston Astrodome. He correctly estimating the increased likelihood of capturing a shot of the ring from that height. With equally good fortune, he activated a remote-control camera at the right moment. It has been said that it’s the only photo Neil Leifer took himself that is hanging in his house, also he regards this as his favorite photograph from a 40-year professional career. This angle and that this was taken at that exact moment, makes this an amazing picture. There were probably many photos taken in the several minutes leading up to that moment, increasing the odds of achieving such a shot. Professional photography takes a lot of planning and while happy accidents do happen, a shot like this shouldn’t blow you away with the timing but with the preparation. This was probably a matter of getting up in the perch, getting ready your exposure, and just waiting for Ali to do what Ali did best. Timing this shot was probably the least involved thing the photographer did. Williams had been inactive the entire year of 1965 while recovering from gunshot wounds he suffered at the hands of a police officer arising out of a traffic stop. Boxing reporter Jerry Izenberg adds “…shot for no apparent reason”. Williams was shot with a .357 Magnum in the abdomen, barely survived, and suffered permanent kidney damage, a loss of over ten feet of his small intestine, and nerve damage from the bullet which affected his left leg above the knee, causing it to atrophy as a result. Williams didn’t however bear the policeman any malice. Some thought he had resisted arrest on suspected drunk driving. It was in the above greatly diminished physical condition that Williams fought for the heavyweight championship against Muhammad Ali on November 14, 1966 and was stopped in the third round. Williams retired from boxing after the Ali bout, but later made a comeback. Although able to defeat journeymen fighters, he suffered several knockout losses before retiring for good in 1972. Williams finished his career with a record of 78 wins (58 KOs), 13 losses and 1 draw. In 2003, he was ranked 49th in Ring Magazine’s list of 100 greatest punchers of all time. Ring Magazine in the 80’s reported he drove a forklift truck later for a while as a job. In 1999, Cleveland Williams was killed in a hit and run accident. So sad to go through all of that in your life, just to be hit by a car. Just like BRUCE Jenner, Cassius Clay is NO HERO & quite a hypocritical COWARD in fact,...and boxing is NOT A SPORT! Well SOMEBODY is a tad bitter. What's the matter? You have issues with transgender decathlon champions? What did Ali ever do to slight YOU?